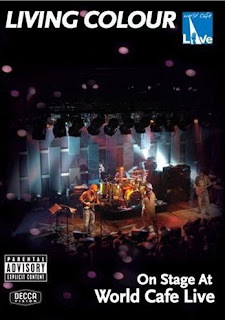 Living Colour Blog: Living Colour : On Stage @ Word Cafe DVD - out tomorrow! Order NOW! Living Colour : On Stage @ Word Cafe DVD - out tomorrow! Order NOW! The hard rock sound of Living Colour is best experienced live, and that's exactly what viewers will get upon watching this entry in the On Stage at the World Cafe Live series. Among the songs performed are "Cult of Personality" and "Open Letter (To a Landlord)."